Does this sound familiar? In the first few weeks of starting my business, I realized that I needed to brand it—starting with a business card so I could hand something out when networking. I was in a hurry so the first thing I saw that looked good to me became the inspiration for my card and by extension my brand. I think it happens this way with a lot of business owners including the marketing agency I used to work for. So don’t worry if it happened to you. It’s not your fault! Here’s the inconsistent look of my branding before. 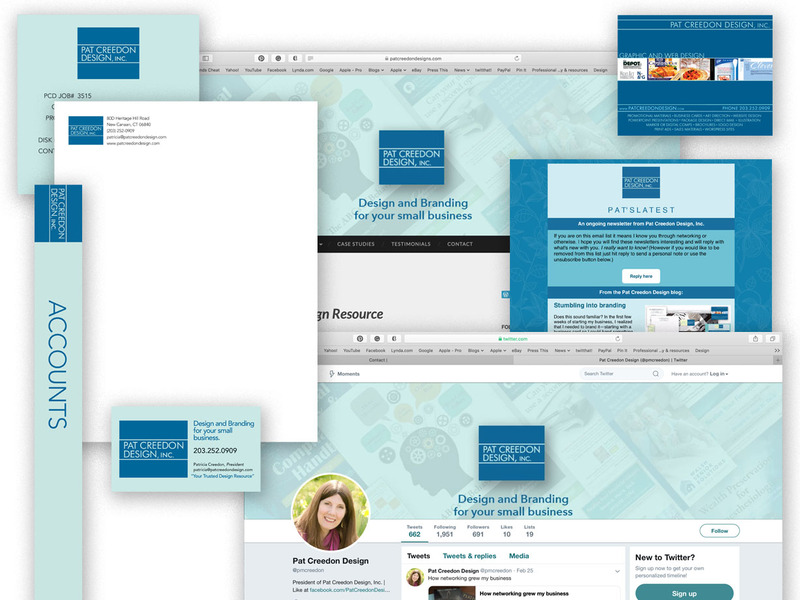 That’s because I created the business card first and then I did an ad (see upper right) based on an early version of my website that I did from a template. So I combined the two looks in a sort of transition over to one or the other. Not sure which way to take it I got a trusted second opinion and I was able to see the right path to take. Here is the after. Notice the consistent color scheme, logo treatment, graphics for the background, fonts, etc. Now I’m clear on the look of my brand and it instills confidence in my small business. If you would like the confidence that professional branding can bring to your business I am ready to help. We offer a Free consultation to help you see the possibilities! Before I isolated who that person is I would get people that were hard to work with, sure they could get it done cheaper online, not sure they even needed decent design and were unreliable in getting back to me. It’s been a lot easier to get the sort of client I love working with and to describe them to my friends and associates once I had a clear idea of who they were. To sum up, my ideal client is a business owner or entrepreneur who likes having a relaxed yet business-like, jargon-free graphic designer they can work one to one with as a trusted design resource. Who loves to meet over coffee (if they are in this area, which they don’t need to be) and works well via email and calls. They understand the need for graphic design for all their branding and marketing materials. They see that by having a reliable, creative designer to work with their communications will improve and look more professional. They have no problem with my prices because they know it’s a great investment in their business. They love the results they get. They write testimonials and they tell others about me. If you are or know anyone fitting that description, send them my way. I’d love to meet them. Who do you describe as your ideal client? Add your comments here!